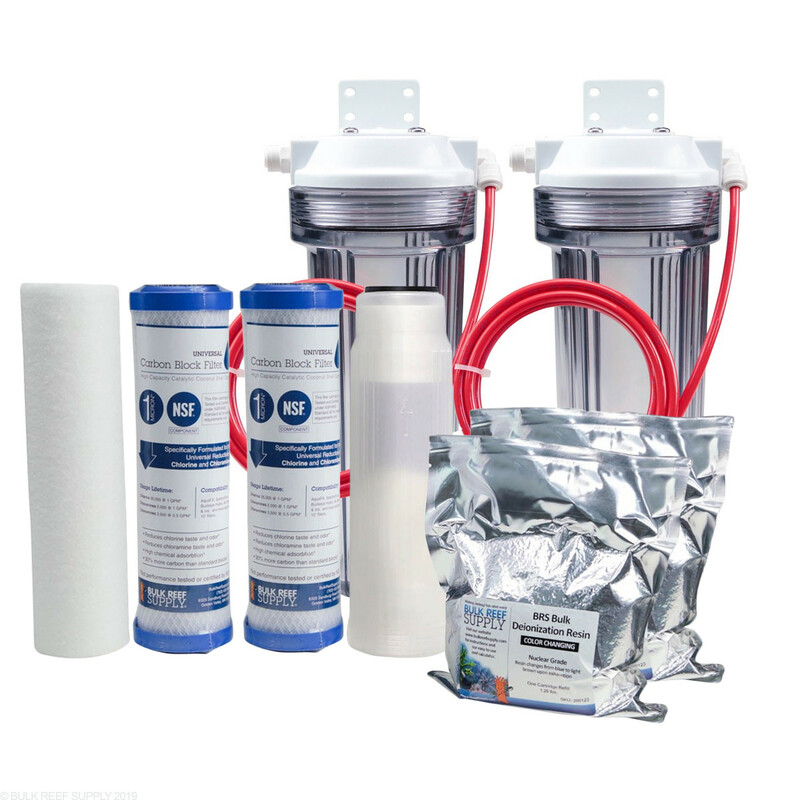 If you find out your water supply is now being treated with chloramines, and you currently have a BRS Value (or most other 4 stage) RODI system and need to upgrade it to a 6 Stage Deluxe RODI system we have put together a kit that is easy to install. Instead of having to buy a new RODI system or trying to figure out every little part you may need to upgrade your current system, we have put together an upgrade kit with everything you should need including filters and DI resin. One of the main points of focus when it comes to RODI systems is chlorine, and chloramines. More and more cities are starting to use chloramines to treat their water because it lasts longer than standard chlorine, which a single carbon block can have a hard time removing on its own. This kit is designed to add two additional canisters to your 4 Stage RO/DI system to upgrade to a 6 Stage Deluxe RO/DI system. One canister should be installed before your system and used to house a sediment filter which allows you to use the two pre-filter canisters on your RO/DI system to house dual BRS Universal Carbon Blocks. The other canister should be installed after your system and used to house a second deionization cartridge and resin. I added this to my 4 stage ro/di system that I have had for years. I started to notice a strong chlorine odor in my top off container that kept getting worse. Chloromines in my city water were the culprit and knew I needed to upgrade my ro/di for the health of my tank. I ordered a refillable DI cartridge since this kit only provides one (it does come with 2 refills though). Great value and beat buying a new 6 stage filter. Easy quick install! Highly recommend this if you need to upgrade your 4 stage filter. Upgraded my 4 stage unit to a 6 stage unit in about 2 minutes! Simple straight forward process that will provide perfect RO/DI water. High quality parts and fast shipping. You can't go wrong with this package. I found out my city uses chloramine to treat the water so I decided to get this upgrade to add to my 4 stage unit. Very easy to install, would highly recommend this upgrade. As if I wasn't happy enough with my BRS Value RODI system, adding the Value to Universal and Water Saver kits made me want to party. For sure, this is the industry standard for value, not just because Ryan says it so eloquently on his video. I shopped around and replaced a piece of junk I got in Amazon. I specially like the flexibility of being able to just get the basic Value model and upgrade as you can or need. This is a nice upgrade kit for any to system. Easy to hook up and get running. Great value. Went together easily. Would recommend. I added the 6 stage kit along with the booster pump. I wish I would have done this two years ago. I have 90 psi of pressure and don't have wait all day to do a 50 gal. water change. I have gotten my phosphate down after working on it for a month. the phosphate was off the chart. Once I could do a 50 gal. change every two days its down to .2 And has been down for a week. Thanks to no more waiting for my ro water. I had a 4 stage 75 GPH . with 6 stage up grade and up grade GPH to 150. All I can say is I wish I would of did this from the start. Way more water pressure even. Easy way to take your current RO and make it better! I just bought these extra housings to upgrade my 6 stage to an 8 stage due to heavy sediment in my water and I absolutely love them. The acrylic housing is very thick and seems indestructible and very high in quality. Also the 1 and 5 micron sediment filters are awesome and seem to last longer than my previous filters. I haven't had any problems with leaking and from the construction quality I doubt it will ever happen, just plan on keeping the o ring seals moist and if you notice any cracking in the future it is a very inexpensive replacement. Thank you BRS for this quality product. I would highly recommend adding this to a smaller system or if you are extra cautious about water quality like me you can add to an already large system for added peace of mind. I already have a 4 stage. I live in MN, 3 hours from you guys and have high cloramines. I am looking to upgrade to a 6 stage. Are the carbon filters rated for high cloramine? I need to replace every filter in my 4 stage now, and then add the other 2. Will this one kit serve all of my needs (except for the RO membrane that I see I need to purchase separately)? The BRS Universal Carbon Blocks were specifically chosen for their superior performance with chloramines. The kit will let you place a canister before your system for the sediment filter, and then the first two canisters on your current system will house the two carbon blocks that are included. The kit includes the second canister to go after your current DI stage to add a second stage of deionization. The kit includes all the filters you would need for a standard 6 stage RODI filter change. 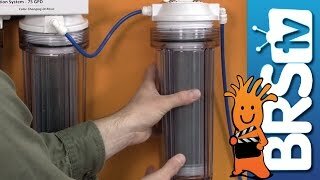 You are correct the membrane needs to be purchased separately, but since they usually last a couple years they usually don't need to be replaced as often as the rest of the filters. I just purchased this upgrade, and have it up and running. Question is, I have the TDS meter before the DI resin block and the out coming out of the last DI block. I moved it when I installed the upgrade is this current? Moving the TDS probes is ideal. As you have installed it is correct, with one probe before the DI and one probe after. Feel free to let us know if you have any further questions! Do the packets of deionization resin come with this product? The kit will come with both packets of DI resin. It will come with every item in the product photos. Feel free to let us know if you have any further questions! Will this upgrade work with other non-BRS systems like Spectrapure? If so, will it require any modification on either end? We unfortunately are not certain if all other companies will use the same size tubing or other components however it certainly should as long as 1/4" tubing and the membrane is 75 GPD. Feel free to let us know if you have any further questions! Does this come with instructions on how to connect the upgrde kit to the BRS 4 stage system? Also is this the best package to remove chloramines? I have attached a video with instructions for the Value to Universal. This is the best option for chloramines removal. Feel free to let us know if you have any further questions!